Easy access for summer fun at Pinecrest Lake as well as winter sports at Dodge Ridge Wintersports Area. Parking for two cars right in front of the main entrance to this great mountain cabin. AND...pets are welcome! Just a block off Highway 108, easy access on and off the main artery of our mountain oasis. There are three bedrooms and 1.5 bathrooms. First bedroom on main level has a king size bed there is a full bathroom (tub and shower) on this floor as well. Upstairs you will find a half bathroom and two bedrooms, one with a king bed and the other with two single beds. There are TV's in each of the three bedrooms. There is a floor grate for heat in the dining area, please be careful. One television with cable located on the main floor of this cabin as well as a well stocked kitchen. Off the living room you can access the deck which has a gas barbecue, table and chairs and a comfy swing to lounge on. 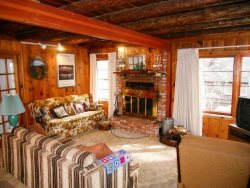 This cabin is full of nostalgia and knotty pine, if you want a true mountain experience you want to stay at the Sierra Village cabin. We must have 24 hour notice prior to your arrival. After hours number is 209-770-1624. Propane heat throughout. There is a floor grate in the living room, please be cautious.